Mobile access is becoming increasingly important in today's connected world. A mobile component for your services and applications is no longer optional but a requirement for success. Advanced Installer raises to the challenge and helps you quickly and effortlessly build installers for mobile devices based on the latest Windows CE OS-based platforms. A dedicated Windows Mobile CAB project type offers simple to use, optimized views allowing you to easily add resources, set options and specify installation properties. 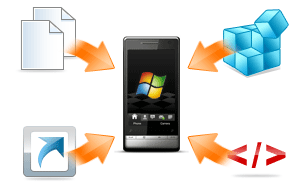 Install Windows Mobile CABs through desktop MSI packages. Group related packages and prerequisites. Specify install conditions, taking full advantage of Windows Installer's facilities. A requirement on most smartphones, avoids warning prompts, heightens device security and gains your customer's trust. With Advanced Installer you can digitally sign your mobile installers and executable files with just a few clicks. Save time and effort. Don't duplicate work. Targeting multiple mobile platforms? Need slight variations of your installers for different markets or customers? Advanced Installer will easily build multiple mobile installers, with different configurations, from a single project.